Many people go east on expensive fall foliage trips. That region is well known for its spectacular trees in hues of yellow, orange, red, purple and brown. Just like the Atlantic Provinces, the broadleaf trees surrounding Powell Lake start to turn color in late September through October. Right in front of our cabin, Goat Island has a superb display of maples, dogwoods and alders. The swath of glorious color paints up the hillsides through stream carved gullies and across expose rocky slopes. Have you ever wondered how this colourful display occurs? Chlorophyll, which is the pigment that gives leaves their green color, gets energy from sunlight to transform carbon dioxide and water into carbohydrates (sugars and starch). Leaves also have yellow to orange pigments called carotenes and xanthophylls, but these colors are overpowered by chlorophyll most of the year. But when fall arrives, things change. Fall days are noticeably shorter and trees start getting ready for winter. The presence of chlorophyll, and its green color, begins to diminish. This allows the yellow and orange colors to become more dominant. The bright reds and purples are created when glucose (sugars) are trapped in the leaves after photosynthesis stops. Bright sunny days and cool nights in autumn cause leaves to turn the glucose into a red to purple color. The brown color is made from wastes left behind in the leaves. As fall moves towards winter, leaves begin to fall. Where the stem of the leaf is attached to the tree there is a special layer of cells. This layer gradually breaks down until it can no longer support the weight of the leaf. When storm winds blow, the leaves fall to the ground. Trees become dormant and live off the food they have stored over the summer. Their stems, twigs, and buds are equipped to survive extreme cold until the following spring. Fallen leaves are not wasted, at least in nature or by the composting gardener. They decompose and replenish the soil with nutrients. They become part of the thick humus layer of the forest floor. There they absorb rainfall and hold moisture. They also become food for organisms that are important to the forest ecosystem. I learned not to give up on cucumbers. After two types died, the third was a success. I'm going to try eggplant again next year just to make sure and I'll augment the soil or rotate crops to get my zucchini back up to par. I had to go down to my former school district to help out with a few consulting projects. Wayne said he had to stay behind to mow the lawn. Now, I don't think I'm dumb enough to buy that excuse, but he did use his "time alone" wisely. I've already shared how we painted our cabin's cedar deck with wood stain. We still needed to do our shed and bridge to shore. But rather than make everything beige, we decided to accent it with redwood. 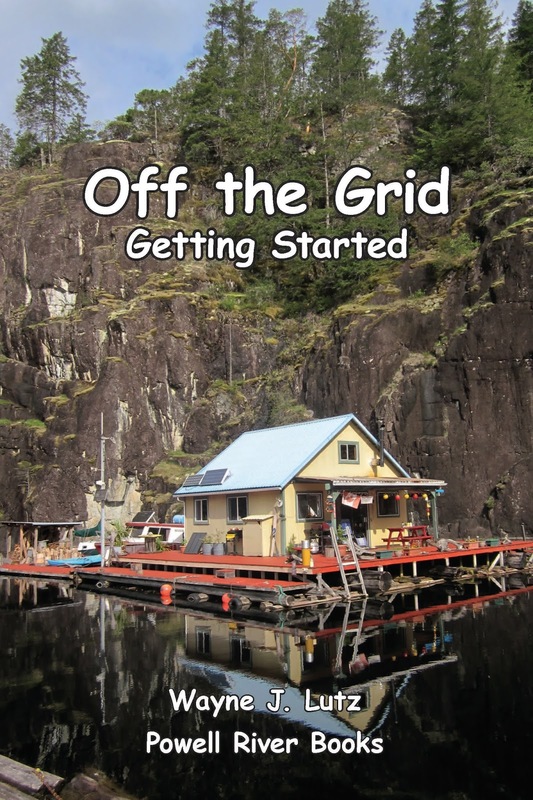 On Monday, I shared how our good friend John got his air compressor running. Here's why. 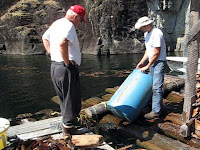 Last summer we hired a scuba diver to help John put fifteen 55-gallon plastic barrels under our float cabin. We've added extra weight (translated stuff) to the float over the years. The plastic barrels filled with air make the cedar log float more buoyant. 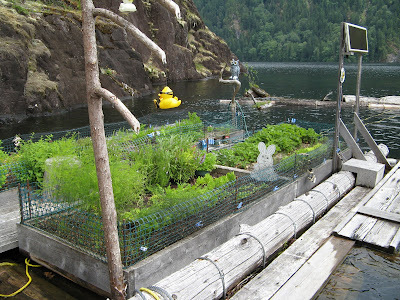 This year we needed to add barrels to our floating woodshed and my garden float. Both had logs completely submerged. The bottom of our firewood pile was soaking wet and my garden soil couldn't drain. Plus, the longer the cedar logs stay submerged, the quicker they become waterlogged. While Wayne and John were making it happen, I filmed the steps. Take a look. Float cabins sometimes need a little help with the float part. 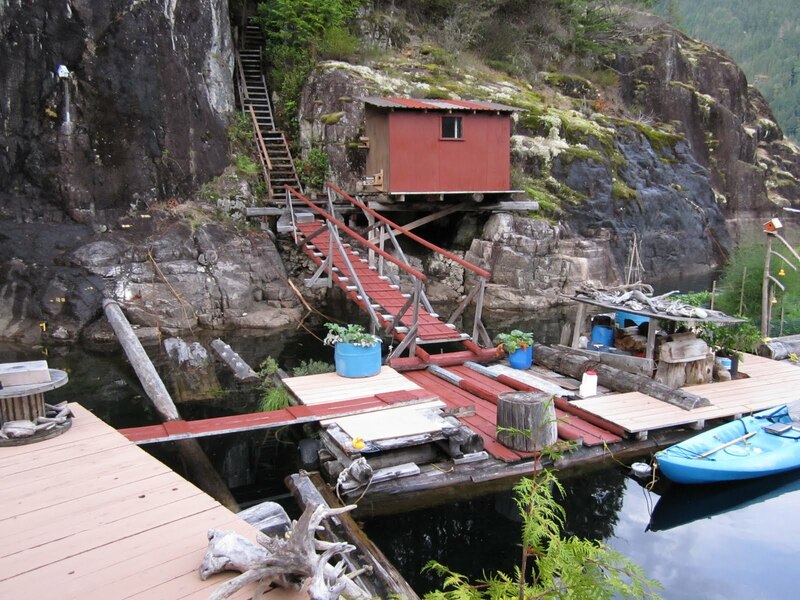 Cedar is well known for its buoyancy and resistance to water-logging, but even 40-foot logs will sink over time. 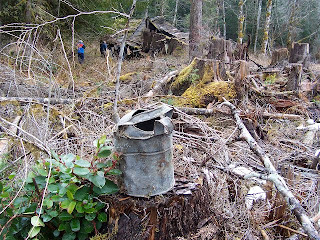 In the "old days," they used to shove a dry log underneath to raise a float back up. 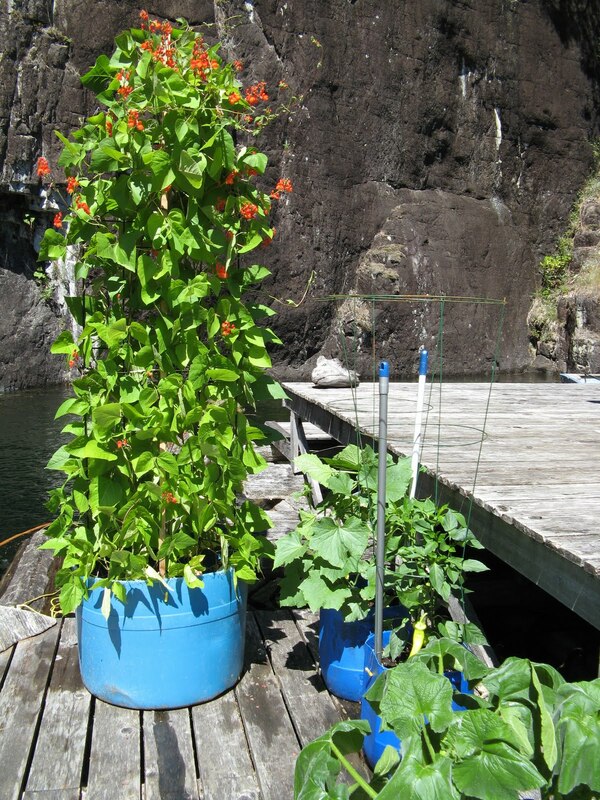 Now, plastic 55-gallon barrels and 275-gallon plastic totes are used to give that added boost. Watch later this week for a post about the whole process. But before we could begin, we needed a compressor to fill our barrels with air. That's where Mr. Fix-It Man comes in. Of course, that's our good friend John. If it needs to be done, he can do it. And coaxing an ancient compressor he found in the bush back to life was right up his alley. Here's a short video of Mr. Fix-it Man, er John, in action. Berry season is drawing to a close. I've been freezing my meager strawberry pickings. Wayne hates this in our small cabin freezer, but I assure him the inconvenience will pay off. I had about two cups of wild blackberries and a few stalks of rhubarb. I had all the makings for an end-of-season berry pie. I followed the Fannie Farmer recipe for a double crust 8-inch pie. I love to use Crisco. It doesn't need refrigeration and makes the flakiest crust. Mix flour and salt. Cut the shortening in until it's crumbly. Add cold water slowly until the dough forms a ball. I refrigerate my dough before rolling. It makes it so much easier. The rest was easy. I put the blackberries on the bottom and sprinkled them with a liberal coating of sugar and a tablespoon of flour. Next came diced rhubarb and my strawberries. Another liberal coating of sugar and a tablespoon of flour. Top with a few bits of butter before covering with the top crust. Our float cabin was built by our good friend John in 1998 from the cedar log float up. We knew the logs were reused, but didn't know the whole story until Wayne and John had their overnight quad adventure. It was a helicopter landing pad when Salisbury did shake block logging. Check out this YouTube video by heliben5 to see how it is done. You can even see them fly past our cabin. Our cabin deck is twelve years old and starting to show its age. Liquidation World had wood stain available at $9.99 a gallon so we decided to paint our deck to see if we can get a few more years of service out of it. We used a brush to paint the edges, knots and deep cracks. Then each section got two coats of stain. The stain dried in four hours, but we had to wait 24 to put on the second coat and then another 24 to put all of our stuff back. We picked beige to make it light and bright. I liked the natural colour, but it was too late to use a clear stain. Maybe next time when the deck is new. Sometimes we get a day of absolute calm on the lake. If you take a picture of the reflections, it can be hard to tell them from the real thing. Before I left Powell River for a trip to the States, I picked a big batch of blackberries. 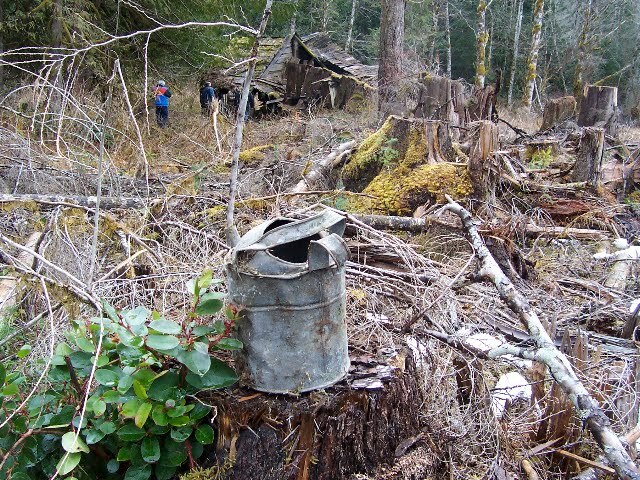 Almost everywhere you look within a kilometre of the chuck (ocean) you'll find vines growing in logging slashes, along road cuts and even on empty lots in town. I wanted to save a bit of the blackberry season to enjoy this winter, especially for some winter blackberry pancakes. I used the books Stocking Up by the editors of Organic Gardening and Farming and the Farm Journal’s Freezing and Canning Cookbook as guides. Pick as many ripe berries as you want to preserve. Wash and drain the berries in a colander. Fill canning jars to ½ inch of the top, gently shaking the berries down to remove empty spaces. The berries will shrink during processing. Cover the berries with boiling syrup (medium recommended) to ½ inch of the top. Remove air bubbles with a non-metallic spoon or spatula. Wipe the rims and cover with snap lids and rings. Process in a boiling water bath, 10 minutes for pints and 15 minutes for quarts. I used half-pint jars (a better serving size for us) but went ahead and used the 10-minute process time. You need about 1 to 1½ cups of syrup for each quart of fruit. Medium syrup retains best colour and shape of fruits. You can replace up to half of the sugar with light corn syrup or mild flavoured honey, if desired. Heat sugar and water together until the sugar dissolves. New to canning, I'm still a bit afraid of spoilage. I've stuck to fruits and pickles that can be processed in boiling water baths. These foods are more resident to bacterial growth and deadly botulism. Even so, I have been very careful to sterilize and follow processing guidelines. The other day I was visiting Nydia's blog called Bringing Up Salamanders. 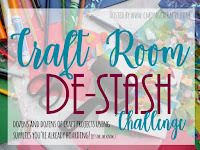 She posted about crafting and how her tore on Etsy is doing quite well. I mentioned that I'd been doing a bit of crafting and she was so gracious to ask about it. So Nydia, this post's for you. At the cabin, I've recycled old spice containers and have been living with hand written labels. I decided to spruce things up a bit. I left the original labels on and paint them with two coats of acrylic paint. Then I paint the spice's name and an illustration to make a new label. I think they came out pretty attractive. Now that's recycling with style. Do you recycle and repurpose? 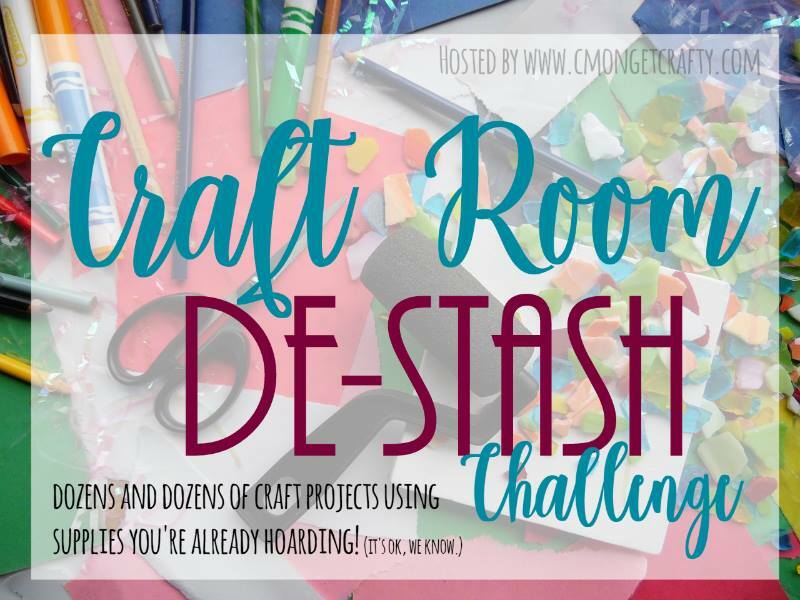 What are some of your recycling endeavors? Every year it's the same. My peppers and tomatoes just start producing, and I have to leave for an extended trip to the States. At least with all the warm weather in August, we got a few fresh ones to enjoy. Yesterday I went out and stripped all of my tomato and pepper plants and took everything to town for preserving. I put my green tomatoes in the refrigerator hoping they won't ripen until I return. I cut the large peppers in half, cleaned and froze them for future stuffed peppers. The rest I froze in containers for handy soup starters. I had some leftover celery (store bought), zucchini, banana peppers, plus my tomatoes and bell peppers. I cut them all into bite-size pieces and layered them in my Bernardin Freezer Jars (Ball brand in the States). These are handy to stack in the condo freezer, but take too much room up at the cabin. I take one at a time up there to have on hand for winter soups. The rest remain in town waiting their turn. Every time we come to town we are amazed at the sunsets here in Powell River. We love our cabin, we miss sunsets up there. Our bay is protected by hills and trees, blocking both the eastern and western sky. That's perfect for storm protection, but not so great for sky views. 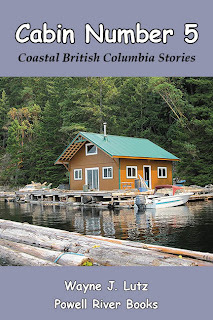 Last spring, Tourism Powell River brought together local writers for a special project, getting the word out about our wonderful town and the surrounding area. From those submitted, twenty stories were selected to highlight some of the unique aspects of life, culture, activities, and fun in Powell River. 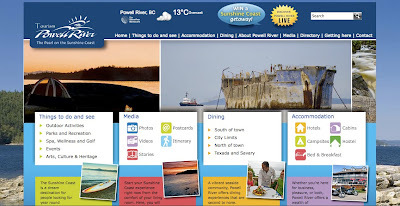 They have now been posted at the Tourism Powell River website for your reading pleasure. 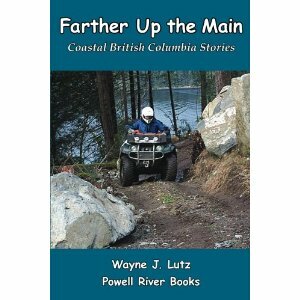 Wayne and I are proud to announce that Powell River Books is responsible for four of those stories. Into the Back Country about ATV riding. 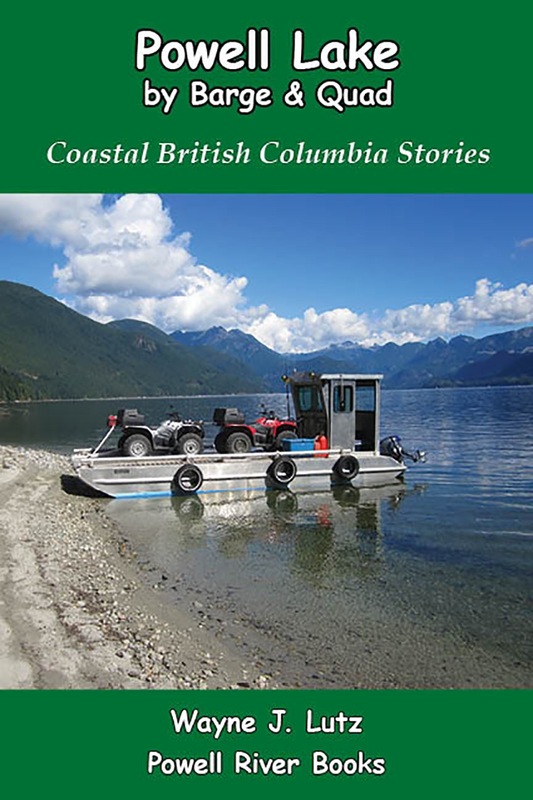 The other stories include topics about history, Texada Island, kayaking, fishing, camping, and much more. Head on over the the Tourism website to read them all. My floating garden and containers produce things we eat fresh. The trick is, to get our garden goodies to come in when we need and can use them and right now we are getting a good combination of items to eat. I pulled my onions in mid-July and cured them for storage. This year's crop was pretty puny, so they are already almost gone. Same goes for zucchini, but my bell peppers and tomatoes are producing well. What better way to combine these items than on skewers to go with BBQ beef ribs. After over a month of continuous sunny, warm weather, Coastal BC has started receiving the showers that are more common in our area. First Narrows on Powell Lake tends to create weather of its own. Here a cloud is sandwiched between the top of Goat Island and the blue sky above. One treasure came from a "dump" along the shore. The contents probably came from old homesteads. Amid the trash he found a cast iron goose. It had one leg and was rusted, but John knew it was a perfect treasure to bring home for me. Besides, it didn't take much space on his quad. My goose has a prominent perch in the kitchen, but has continued to deteriorate. I decided it was time to do something about it. And it was a good thing I did. When I moved him, half of the head fell off and by the time I got it to the picnic table, the other half went too. I whittled a stick to fit into the neck and glued the head back together with some Amazing Goop. I also used the Goop to seal the edges of the cast iron halves and sealed the surface with several coats of polyurethane. While I was at it, I made a bark brace for his missing leg. Now Mr. Goose should last for years to come.